A rare opportunity to see this blues super group locally in the intimate setting of the Lake Theater. Winners of two prestigious Muddy Awards for Performance of the Year, the band consists of some of greatest talent in the area and beyond. 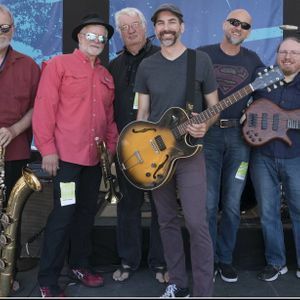 This show will feature 2015 Blues Music Award Winning drummer Jimi Bott (Fabulous Thunderbirds, Mannish Boys, Rod Piazza), Chris Mercer - tenor sax (John Mayall, Freddie King, The Pretenders), Jonathan Chase - bass (Kevin Selfe, Rose City Kings), Joe McCarthy - trumpet (DK Stewart, Duffy Bishop), Brad Ulrich - baritone sax (Duffy Bishop), Steve Kerin - keys (Rose City Kings, Too Loose Cajun Band, Atomic Gumbo), and Kevin Selfe - guitar and vocals (CBA Hall of Fame Inductee for Electric Guitar and Traditional Blues Act) . A native of Roanoke, VA, Kevin Selfe learned to play the blues by watching the masters that lived and traveled through the area. Having combined this influence with his own distinct style, Selfe developed a swampy, primal sound that is reminiscent of humid, summer evenings in the rural South. He relocated to Portland, OR in 2007 where he is now a leading light in the Pacific Northwest’s robust blues revival. Selfe is a two time inductee into the Cascade Blues Association Hall of Fame for Electric Guitar and Traditional Blues Act, and his band, Kevin Selfe and The Tornadoes, has received prestigious Muddy Awards for Blues Act of the Year eight times. His recordings on world renowned blues labels Delta Groove and Vizztone have landed on the Billboard Blues Chart and have been featured on SiriusXM radio.